My flight back from Kansas City arrived on Easter Sunday right around dinner time. I didn't have any food at home, so I thought this would be a good excuse to go try another restaurant. Problem is, many restaurants aren't open on Sundays! Tipped off by Rodzilla, I was going to try Tamari in Lawrenceville, which is on my wish list and normally open on Sundays, but alas, it was not open that day. 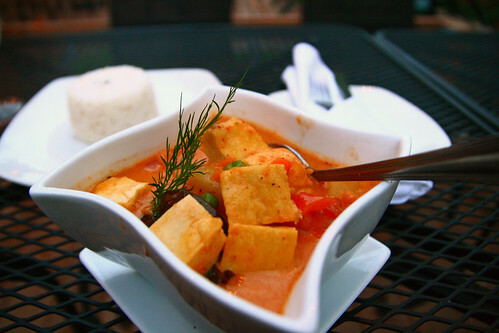 Luckily, I know of another great restaurant in Lawrenceville just a little ways down the street from Tamari, and so I headed for the little family-run Pusadee's Garden. Pusadee's Garden was actually the second restaurant in Pittsburgh I had ever been to since moving here last August when my friend and his girlfriend suggested to meet here for dinner. The inside of the restaurant is pretty minimalistic - white/beige walls with few decorations, and in fact, the interior space feels to me to be a bit small and crowded - and mind you I am no claustrophobe. 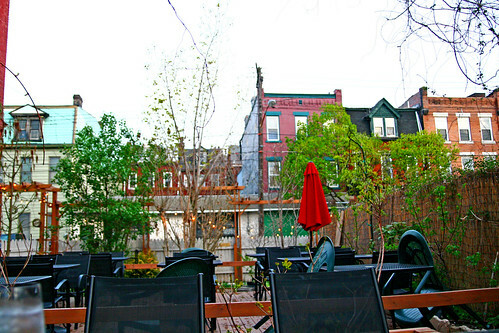 But head out to the courtyard, and it is a completely different atmosphere: cute, charming, yet down-to-earth. It feels just like you're in someone's backyard garden. (Actually, it is Pusadee's backyard garden as fresh herbs are grown here.) On this visit, I specifically requested patio seating, which was surprisingly empty on this day - I'm guessing because it had rained earlier. You can't tell too well from the photo, but I actually really appreciated that the tofu isn't deep fried, which is how many restaurants do it. The curry also comes with bell peppers and pineapples, and there was so much sauce that after finishing the rice I still had half the sauce left to take home. It was one delightful meal turned into two! The service was also very pleasant. What a nice welcome back to Pittsburgh!